Brian Halquist Productions is proud to announce the signing of super middleweight contender Mike “Imagine Me” Gavronski (24-2-1, 15 KOs) to a multiple-year promotional contract. Gavronski is currently ranked No. 5 by the WBA’s North American Boxing Association (NABA), No. 5 by the IBF’s United States Boxing Association (USBA), and No. 2 by the WBC’s North American Boxing Federation (NABF). “It’s exciting. I think we have some big opportunities coming our way,” said Gavronski, a native of Tacoma, Wash.
Gavronski will have his first bout under the promotional agreement in the main event at Battle at the Boat 113 at the Emerald Queen Casino on Saturday, Nov. 18 against top contender, Andrew Hernandez. for the WBA-NABA super middleweight title. Gavronski is coming off a TKO victory over Brian Vera on Sept. 9. It was his fourth consecutive win. Following a loss to Dashon Johnson in a bout for the vacant WBA-NABA USA super middleweight championship on Nov. 7, 2015, Gavronski has been on a tear. He returned to his winning ways on Sept. 10, 2016 by handing previously undefeated Australian champion Jake Carr his first career setback with a sixth-round TKO. Carr has since won his last three fights. 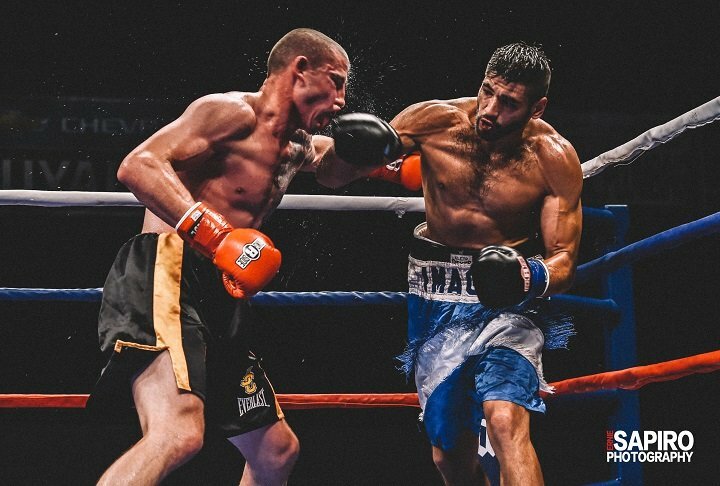 Following the Carr victory, Gavronski squared off against knockout artist Thomas Awimbono, who was looking to extend his 18-fight winning streak in their Nov. 19, 2016 bout. That failed to happen as Gavronski dominated their showdown, winning by unanimous decision in a lopsided affair. Gavronski made his 2017 debut on June 3 when he stepped into the ring to face Quinton Rankin (12-3-2). Gavronski would once again win by unanimous decision, placing him right on the doorstep of a top 20 world ranking. Before turning pro in 2010, Gavronski was a local amateur sensational. Training with the Tacoma Boxing Club, he was a three-time Tacoma Golden Gloves champion, winning the 165-pound title three consecutive years (2006-2008), and earned the prestigious Tacoma Golden Boy title, which is presented annually to the tournament’s most outstanding boxer, in 2008. Gavronski made his pro debut on Jan. 9, 2010, defeating Darren Anzai by TKO at the Emerald Queen Casino. He has fought 12 times at the Tacoma venue, posting a remarkable record of 11-1-0 with 6 KOs. After opening his career with a record of 14-0-1, Gavronski faced future WBC Silver middleweight champion Tureano Johnson for the vacant WBC Continental Americas middleweight title on July 11, 2014. Johnson would win by decision. Gavronski responded to the setback by winning his next six bouts, including a victory over Dashon Johnson.